Employment Security is an equal opportunity employer and provider of employment services. It also is home to the Governor’s Committee for Disability Issues and Employment. I sat in a class recently and noticed my friend and colleague (let’s call her Jean) sitting on the other side of the room, squinting at slides our instructor was showing. Jean has a vision disability. Seeing her struggle to read, I got up, walked to the light switch and turned up the lights on her side of the room. During our break, Jean was clearly upset. Then, she really let me have it. She does not want to be treated differently because she has low-vision disability, she said. How dare I treat her as if she is helpless! She can turn up the lights herself, she said. This was an embarrassing but enlightening moment for me. I learned never to make assumptions about people or their disabilities. I don’t assume what someone wants, what he or she feels, or what is best for him or her. Now, if I have a question about how to help, what language or terminology to use, or what assistance to offer, I ask. The person you want to help should be your first and best resource. People with disabilities have different preferences. Just because one person with a disability prefers something one way doesn’t mean that another person with a disability prefers it the same way. WorkSource Spokane staffing levels and office space are both stable after recent downsizing of both, said Journal of Business reporter Linn Parish in a July 16 story. As the unemployment rate in Spokane County — currently at 6.3 percent — continues its decline after the Great Recession, the mix of customers also has changed in the last five years, Parish reported after an interview with WorkSource Spokane Administrator Michelle Sanchez. “Sanchez says that in 2010, WorkSource Spokane assisted 27,000 job seekers and 6,000 potential employers. So far this year, the agency has helped about 5,000 people looking for work and 14,500 employers,” wrote Parish. Read the entire story in the Spokane Journal of Business. Each month, the Employment Security Department releases statewide and county employment and unemployment data for the previous month. Find more labor-market data and analysis on the Employment Security website. In the Kennewick-Pasco-Richland Metropolitan Statistical Area (MSA), which equals Benton and Franklin counties, May’s preliminary numbers show growth in nonfarm employment reached 107,200 jobs, up by 1.0 percent from April and up by 3.0 percent from the same time last year. The unemployment rate was at 6.7, which is up from the revised 6.5 percent in April. The Benton County rate was 6.6 percent and the Franklin County rate was 7.2 percent.The major driver of the rate increase was growth in the labor force 1.9 percent, or 2,400 workers. Monthly nonfarm job gains were recorded in many industries, including construction, transportation and utilities, educational and health services, leisure and hospitality, and state and local government. This report provides an update on the Wenatchee Metropolitan Statistical Area (Chelan and Douglas counties) economy incorporating not seasonally adjusted, nonfarm employment and civilian labor force data. Analysis focuses on year-over-year (between May 2014 and May 2015) and average annual (between 2013 and 2014) changes in the labor market. Preliminary labor force data show that Washington state’s average annual not seasonally adjusted unemployment rate decreased eight-tenths of a percentage point between 2013 and 2014, from 7.0 percent to 6.2 percent. Between the Mays of 2014 and 2015 the rate declined seven-tenths of a point, from 6.0 to 5.3 percent. In Chelan and Douglas counties, the annual average unemployment rate fell from 7.5 to 6.6 percent between 2013 and 2014, a nine-tenths percentage point drop. The rate decreased one and two-tenths percentage points this May to 6.2 percent from the 7.4 percent reading in May 2014 (see Figure 1) as the number of unemployed residents contracted and the labor force expanded (see Figure 3). 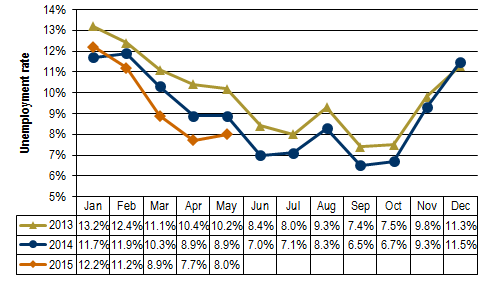 Figure 1: The unemployment rate in Chelan and Douglas counties decreased one and two-tenths percentage points between May 2014 and May 2015. Each month, the Employment Security Department releases statewide and county employment and unemployment data for the previous month. Preliminary labor force data show that Washington state’s average annual not seasonally adjusted unemployment rate decreased eight-tenths of a percentage point between 2013 and 2014, from 7.0 percent to 6.2 percent. Between the Mays of 2014 and 2015, the rate declined seven-tenths of a point, from 6.0 to 5.3 percent. In Yakima County, benchmarked data indicate that the average annual unemployment rate decreased one percentage point between 2013 and 2014, from 9.9 to 8.9 percent. 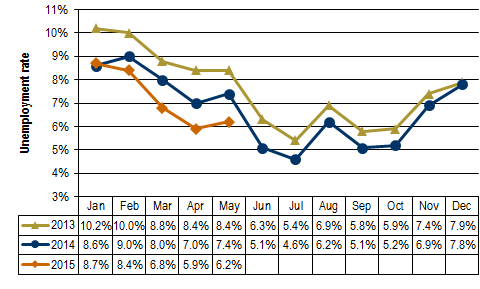 The not seasonally adjusted unemployment rate declined nine-tenths of a point in May 2015 to 8.0 percent, from 8.9 percent in May 2014 (as shown in Figure 1). Figure 1: Yakima County’s unemployment rate decreased nine-tenths of a percentage point between May 2014 and May 2015.